I hand drew the following chart many years ago to help me understand the Bible. While going through some papers one day, I found it; but I had long forgotten about it. I was excited again to see my old Chronology chart and decided to place it online to share with others. The Old Testament is MUCH easier to understand if you know the time periods in which the various Books were written; thus, being able to compare the Books written within the same time period. For example: Look at the chart and you'll notice that 1st and 2nd Kings both fall in the same time period as the entire book of 2nd Chronicles. Thus, we should read 1st and 2nd Kings along with the Book of 2nd Chronicles. In fact, there are several Old Testament Books which fall into 2nd Chronicles. To fully understand the Bible, you cannot read it like a standard book. You need to cross-reference Scriptures. This is clearly seen, and often practiced, with the four Gospels in the New Testament (Matthew, Mark, Luke, and John). Unfortunately, most people don't do the same with the Old Testament Books because the time of their happening is not as obvious as with the four Gospels, which all took place during Christ's life on earth. Also, from looking at the chart, it would be logical to conclude that we should read the Books of Isaiah and Micah together. Isaiah and Micah were contemporaries, both sent by God during the same time period to preach repentance to the Northern Kingdom of Israel (capitol: Samaria). From further observation of the chart, we notice that the prophets Zephaniah and Nahum were contemporaries of Jeremiah. 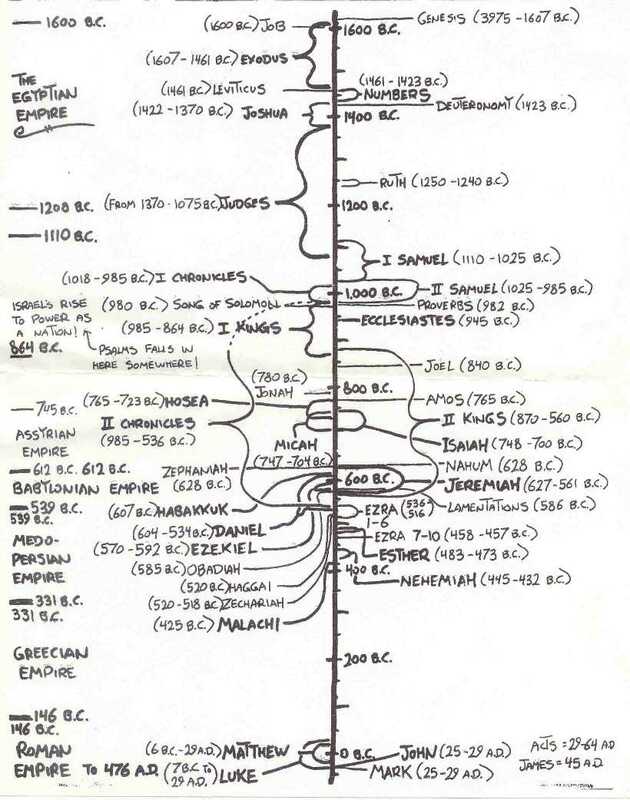 You'll also notice from the chart, the different secular world powers during different periods of the Bible. For example: The Patriarchal Books took place during the Egyptian empire. This is clearly seen at the end of Genesis and throughout Exodus. By the time of Isaiah, Assyria had risen to become a world power. Then we see Babylon ruling the world during the time of Jeremiah, Ezekiel and Daniel. It is much easier to understand the Old Testament when we understand the circumstances during that time period of history. I realize that my chart is not the best; but it worked for me, and I'm confident it will be a blessing to you too. Perhaps you'd like to print out this page and cut out the chart, then place it in your Bible. This is the beginning. According to Genesis, God spoke everything into being and called it good seven times. God made the heavens and the earth exactly as he wanted them. They were perfect and man was assigned to reproduce, fill the earth, and subdue it. This initial glory (i.e. ruling under God) was lost when Adam and Eve chose to grasp at equality with God at the behest of the serpent. The flood was the most comprehensive judgment on mankind to date. It was brought about by God because every thought of man’s mind was only evil continually. The human race had completely spoiled itself. (But Noah was a righteous man, blameless in his generation and he found favor in the eyes of Yahweh). Abraham is the father of the faithful, the patriarch of Israel who obtained the promises of land, descendants, and blessing. He is the father of Isaac and the grandfather of Jacob (whose name was changed to Israel after wrestling with God). Also descended from Abraham is Ishmael (the patriarch of the Arabs) as well as Midian and quite a few others through his second wife (after Sarah died). The world experienced a famine and God had already providentially put Joseph (one of the 12 sons of Israel) in the right place at the right time. Israel and his children and their wives and children and servants all travel to live in Egypt. After the Pharaoh who knew Joseph died, a new Pharaoh arose who began to persecute the children of Israel. Eventually the Egyptians enslaved the Israelites and even had their male children killed at birth to curb the population and make it more manageable. God raised up Moses to deliver the people from Egypt and through 10 plagues demonstrates his power and makes a name for himself. The last plague is the execution of the first born unless the house had the blood of a lamb (or goat) on their door posts. The Israelites were expelled after this last plague and made it through the Red Sea and then eventually to the Mountain of Sinai where God gave them the covenant. Israel spent 40 years in the wilderness because when they reached the promised land, they refused to enter it. Now under Joshua, the successor of Moses, the people conquer the east side of the Jordan and then make their way into the land via Jericho. This is the first time Israel actually possesses the land promised to Abraham, Isaac, and Jacob. The period of the Judges covers a few hundred years during which a cycle repeated itself over and again. (1) The people become oppressed by a foreign nation and call out to God in their despair. (2) God raises a Judge or Deliverer to obtain military victory. (3) The people become complacent and “everyone does what is right in his own eyes” which causes God’s protection to be forfeited. The first king of Israel was from the tribe of Benjamin, called Saul. The kingdom was taken from him and given to David of the tribe of Judah (though David did not rise to the throne until Saul died in battle). Then David’s son, Solomon was anointed above his brothers by David to be king over Israel. Each of these first three kings reigned for 40 years. This is called the “Golden Age” because during it Israel enjoyed peace, prosperity, and they worshiped God. Shortly after the Law was given (BC 1445) Moses was given instruction on building the tabernacle (a tent meticulously designed by God to represent his presence among the people). The center piece of the tabernacle was the Ark of the Covenant containing the tablets of the Ten Commandments and some other items. David wanted to build a “house” for God but was refused because he was a man of war. Solomon used the materials David had laid up for the construction of the temple and dedicated it sacrificing thousands of animals. Then the glory of God visibly came into the temple. Rehoboam, Solomon’s son, does not act wisely and instead of reaching out to the northern part of the kingdom alienates them. This causes a rift between the north and the south. Jeroboam is crowned king of the northern ten tribes (called hereafter Israel) and Rehoboam retains control (barely) of the southern two tribes (called hereafter Judah). other people in Samaria (later dubbed the Samaritans). Under David’s grandson, Rehoboam the kingdom split but God was merciful to the house of David and providentially saw to it that David’s family line continued throughout all the kings of Judah. Jerusalem remained the capital. Hezekiah miraculously survived the vicious attack of Assyria when God sent two angels to defeat Sennacherib’s army. The last kings of Judah were Jehoahaz, Jehoiakim, Jehoiachin, and Zedekiah. At this point, the Babylonian empire conquered Jerusalem three times, the last of which resulted in the cities complete destruction. Historians mark the beginning of the Assyrian empire with the accession of Adad-Nirari II to the throne. Before this Assyria existed but was not very powerful. When Tiglath-Pileser III (also known as Pulu) ascended to the throne, he defeated Babylonia, the Medes, Hittites, Syria, and Phoenicia. He occupied Philistia in BC 738 and subjected Israel to tribute. In BC 727 Tiglath-Pileser III’s was succeeded by Shalmaneser V who died in BC 722 while laying siege to Samaria. Sargon II seized the throne and finished off Samaria and carried off 27,000 people into captivity in BC 721. Under Sennacherib (BC 705-681) an unsuccessful attack was made against Jerusalem and her king, Hezekiah. It really ended in BC 612 when the capital of Nineveh was defeated by the Babylonians. Nabopolassar successfully rebelled and with the help of the Medes defeated Nineveh (the capital of Assyria) in BC 612. Under Nebuchadnezzar’s 43 year reign Babylon was at the peak of its strength. He brought Judah under his control and imposed taxes on them. Judah rebelled, was conquered, then rebelled again, and this time it was destroyed and all the citizens were deported. Nebuchadnezzar was succeeded by Nabonidus who eventually was defeated by Cyrus the king of the Medo-Persian Empire in BC 539 at Opis. Cyrus entered the city of Babylon without fighting. During the third year of the reign of Jehoiakim (king of Judah), Jerusalem was defeated and the some of the vessels from the house of God were brought by Nebuchadnezzar into Shinar (another name for Babylon) (Daniel 1:1-2). Daniel, Mishael, Hananiah, Azariah and others who showed promise are brought to Babylon and trained to be able to serve in the royal court there (Daniel 1:3-6). Judah was made to pay taxes to Babylon but soon stopped in defiance to their foreign conquerors. In the eighth year of king Jehoiachin, Nebuchadnezzar again defeated Jerusalem and carried away the rest of the treasures of the temple, and the treasures of the king’s house, and led away into captivity all the captains, the warriors, the craftsman, and the smiths (2nd Kings 24:8-16). Only the poorest people were left in the land. During the siege, Jehoiachin surrendered and went out to Nebuchadnezzar and was taken back to Babylon. Jehoiachin’s uncle, Mattaniah (also called Zedekiah), was put in charge by Nebuchadnezzar (2 Kings 24:17). Ezekiel may have been taken during this time. He prophesied extensively about the coming destruction of Jerusalem while living in Babylonia near the river Chebar (Ezekiel 1:1-3). Jerusalem again rebelled and the army of Babylon once again defeated it in the eleventh year of King Zedekiah (2nd Kings 25:1-2). Zedekiah fled but was captured; both of his sons were slaughtered before his eyes and then his eyes were put out and he was brought in bronze fetters to Babylon where he died. The temple was burned to the ground to such a degree that when it was rebuilt even a new foundation had to be made. The city walls were completely destroyed along with the prominent houses and the gates to the city (2nd Kings 25:1-21). Jeremiah was in the city when this happened and survived. The land was to lie dormant for seventy years to make up for the Sabbaths that it had not enjoyed (the Israelites were supposed to rest from farming every seventh year, but they did not). There are multiple ways to date this event. Some start in 605 (or 606) and end it in 535 (or 536). Here I have indicated the time from when the temple was destroyed (586) to when it was finally rebuilt (516). However one counts it, the people were able to survive in the foreign regions in which they were transplanted, just as God had prophesied through Jeremiah (Jeremiah 25.1-14). Daniel’s prayer undoubtedly ties in with the end of the captivity (Daniel 9). Cyrus the Great (also called Cyrus II of Persia) successfully defeated the Median Empire, the Lydian Empire, and the Babylonian Empire between BC 559 and 539. His son, Cambyses II conquered Egypt. Cyrus was politically shrewd, modeling himself as the "savior" of conquered nations. To reinforce this image, he instituted policies of religious freedom, and abolished slavery in the newly acquired cities. Other kings in this empire include Darius I, Xerxes I (Ahasuerus), Artaxerxes I, etc. In BC 334 during the reign of Darius III, Alexander the Great successfully established the Greeks as the new empire. In the fist year that Cyrus was established as the king of the empire he issued a decree that the Jews living throughout his empire could return to Judah and rebuild the temple (Ezra 1.1-4). Zerubbabel & Joshua lead 49,897 people back to Jerusalem (Ezra 2.2, 64-65) and begin work on the temple in BC 536. Zerubbabel was the Persian approved governor and Joshua was the highpriest. Prophets Haggai and Zechariah urged the building of temple through their prophecies. The building of the temple was begun in BC 536 but stopped some time before BC 529. The people of the surrounding areas (outside of Judah) discouraged the people of Judah, and frightened them from building, and hired counselors against them to frustrate their work until Darius I became king (Ezra 4.4-5).Then God moved through the prophets Zechariah and Haggai to urge the work to begin again (without permission from the authorities) in BC 520. It was finally completed and dedicated in BC 516. In BC 484 King Ahasuerus (Xerxes I) gave a banquet and his queen (Vashti) publicly disobeyed him. The king sought after a new queen and chose Esther (Hadassah). During this time a man named Haman (who was the right hand man of the king) gained much power and wanted to annihilate the Jews because Mordecai (Esther’s Uncle) would not bow to Haman as he passed. In a last minute effort to defend her people Esther succeeds in gaining Xerxes I’s approval to reverse Haman’s plot and the Jews throughout the Persian Empire were saved. The festival of Purim is celebrated annually (up to this day) as commemoration of this deliverance. In the seventh year of King Artaxerxes I (BC 464-425), Ezra the scribe was sent to establish Mosaic Law in Jerusalem. His mission was to teach the people how to live. He was given a good deal of silver and gold to get the sacrificial system going. BC 445 Nehemiah Arrives in Jerusalem and Builds Wall Governor Nehemiah was commissioned by Artaxerxes I to rebuild the wall in Jerusalem (Nehemiah 2.1). The work began and it was strongly opposed by Sanballat the Horonite, Tobiah the Ammonite official, and Geshem the Arab (Nehemiah 2.10, 19). Even so, the workers continued with incredible speed holding a weapon in one hand a tool in the other. The wall was finished in 52 days (Nehemiah 6.15). Alexander (son of Philip of Macedon) was king from BC 336 to 323 being only 20 years old. He was one of the most successful military commanders in history, and was undefeated in battle. He defeated Darius III at the Battle of Issus in BC 333. By the time of his death (at only 33 years old), he had conquered most of the world known to the ancient Greeks pressing east into India. In the same year, Alexander took Jerusalem and now Judea was a Greek province instead of a Persian one. He founded Alexandria in Egypt (along with a number of other Alexandrias) which became a major city of trade, education, and culture. In BC 331, Alexander was welcomed as a liberator in Egypt and was pronounced the son of Zeus by Egyptian priests of the god Amun. malaria, West Nile virus, typhoid, and viral encephalitis).